Ha:sañ Bak signals the beginning of the rainmaking ceremony. Ha:sañ is the O'odham word for saguaro cactus. Ha:sañ Bak means "the saguaro is ready." Before harvesting the first fruits, Tohono O'odham bless themselves with the saguaro fruit (taken from a fallen fruit). The fruit is rubbed on the body near the heart. The fruit picker asks for a clear mind and a good heart before going out into the desert. The saguaro fruits are called bahidaj. 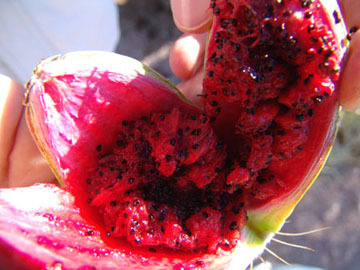 When ripe, the fruit opens to expose the sweet red meat and hundreds of tiny black seeds. Harvesters knock or pull the fruits off the tops of the tall saguaros. The Tohono O'odham place the first fruit picked on the ground with the red side facing the sun once the red meat of the bahidaj is removed. This signifies that the sun will draw up the moisture from the fruit into the sky, to make the clouds and the rain. The saguaro fruit has red meat and the tiny black seeds. Saguaro ribs are used for harvesting poles called kukuipad. The ribs are collected in April and May and are saved from year to year. 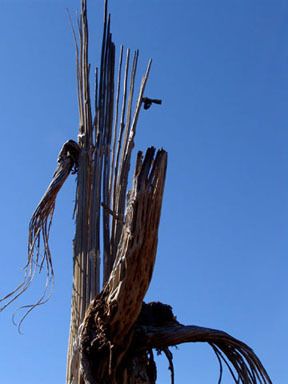 To make longer poles, two saguaro ribs can be grooved to fit together or can be tied together. 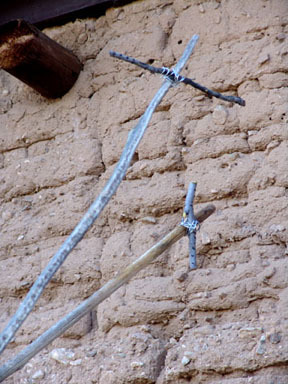 A cross bar made of segai (greasewood) is tied at a 45 degree angle near the top of the pole. The completed poles are tied to a tree while they await the harvest.